When you’re breeding earthworms, it’s not enough that you provide them a nice and comfortable bin to thrive in. You should also be able to provide the right food supply to them. So, what to feed red wigglers then, you might ask? Read on further below to know more. Crushed Egg Shells – adds that much needed grit for the worm’s digestion. 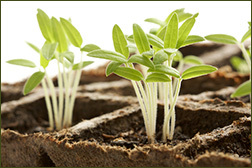 It also provides calcium, helps in the worms reproduction, and also helps in increasing the pH level of the worm bin. 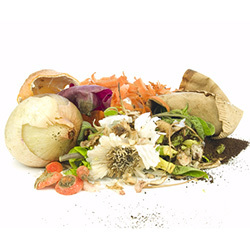 Starchy food wastes – these can be in the form of bread, oatmeal, and pasta. 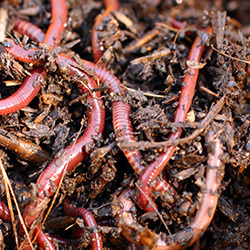 Bedding materials – the materials that you place inside the worm bin can also be consumed by your red wigglers. You can also add pre-soaked peat moss and newspaper shreds (cardboard for some), some soil (avoid the sandy or clayey ones), and coconut coir. Garden wastes – these can be in the form of dried grass clippings and some fallen leaves. Coffee Grounds – visit a nearby coffee shop, as they often give out there used grounds for free. Also add in those coffee filters and used tea bags. Raw eggshells with some egg white’s still stuck inside (it’s best to clean these before using them for your worms, as these may carry diseases that can harm your compost pals). It will stink up the whole bin too if you don’t clean these first. Fats and Oils –also helps in lowering down the pH level of the worm bin; and also causes odor build-up especially when these start to decompose. Meat and Poultry products – these will only attract unwanted pest visits; and will also cause odor build-up. So, always take note of these helpful reminders. You simply want nothing but the best for your red wigglers; and of course, to got nothing but the best results from them as well. Make it a point to take in these considerations on what to feed red wigglers, before you put in any kind of organic waste inside their bin. Get your very own specialized worm feed from us! It’s filled with nutrients, and is very much organic. It’s something that your worms will keep on eating for sure. Our 3 Month Feed Supply will definitely keep your worms healthy, and parasite-free. Get yours now! To know more about the product, check the 3 Month Feed supply here. 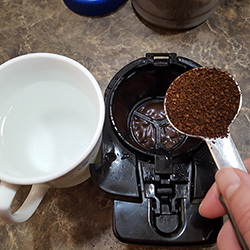 How Can I Re-use Coffee Grounds? “some fallen leaves”? what does it mean by that, is it talking about something like fruit vine leaves? or can it be anything besides something poisonous? No pine needles; Juniper etc. Can I feed ground seed like wheat corn millet Milo black oil sunflower seed to the red wigglers. I read that you can feed cornmeal to the red wigglers but what about wheat flour or rye flour? Hello. I bought worms from you many times. Thank you. Elena, did you get your answers from your question..? Im also wondering if its okay to feed coconut meat.. I have coconut shreds from the meat, but they are oily..Im wondering if that is okay for the worms. They will eat white or yellow. We use yellow corn here at the farm. I originally bought your Red Wiggling Worms for my Vertical Tower Container(s) and then bought a lot more of them for all of my gardens. My problem is feeding the little guys given that my wife is out of time and I have limited organic waste. I do have a fair amount of brown leaves and a lot of compost, including coco coir. I notice that you have a link to worm food for sale but it does not work. George here. What if you ask some friendly neighbours for some leaves or organic waste? You’d be like Sweden who imports all kind of waste cause they need it to warm their houses and to generate electricity =) So your neighbours can colaborate to keep your garden healthy. I am doing a college project on Red Wigglers and I am wanting to know does it matter how much of everything I put in my bid? Should I have more of one thing, how much food should I put in my bid…. This is for a grade so I really don’t want to kill my worms. You want to go lite with your food sources to start. Don’t just dump everything in and think the worms will gobble it all up. Different temps, moisture levels, food sources, and the amount of worms you have all create a situation where you need to learn about how your own bin will respond and how much food stock they can handle at once. I have approximately 300 worms. I puree their food and freeze it in cubes. Should they get one or two cubes once a week – the cubes are larger than regular ice cube I would say they are twice the size of a normal ice cube tray cube. What about flax seed? Is that ok to feed worms? The worms should be fine if left in the bag we ship them in until the following day as long as the sphagnum moss that they are shipped in is kept moist. If you need them for longer than that, putting them in a bucket with some soil and perhaps adding some veggie scraps will keep them for a little while in great condition! lastly to feed on top of the bedding or underneath? I don’t want to commit worm abuse! Either will work. The worms will come to the food. I’ve started a worm bed to be used for fishing. Does the red wigglers enter act ok with other worms I my find over my yard and put them with the red wigglers? I’ve had a red worm composter for quite some time however recently the worms have stopped eating a lot. How can I get them to eat more? I have clipped my jade tree and have many cuttings left over. Can I feed these safely to my red wiggles. I have searched many sites and have not found a solution to my question. Also what other plants can I feed the worms safely. All the sites I have googled only talk about vegetables and not house plants. Please help. Hello UJWF, I was down a few months ago &picked up my 4000 Red Wigglers. Their doing great so far! So its okay to give them boiled & crushed egg shells? Also, would you consider totmatos under Acidic fruits, that would lower the PH? What is the ideal PH for my bin to be? Thank You All! i got a bunch of purslane growing, do you think they would like that?